falcon.16 wrote: Thanks, now i understand better. The FSO from Rafale seems a similar system, because it has a tv daylight beside IRST cone. Or i am wrong? It's similar in that sense. AFAIK, the original FSO had pretty poor resolution IR sensor and some variants didn't even have it. - had far better resolution and was thus superior for ID. Latest IR sensors have pretty good resolution and thus - is not necessary, although it still has some benefits. Most important is ability to see colours which might be useful in some situations. That's why many targeting pods also have -. Sensitivity. Basically sensitivity tells us how weak signals (how little infrared radiation or how cold target is) can be detected. Since IR radiation travels one-way only, sensitivity affects range similarly to RWR or ESM systems (square root). Basically having four times more sensitive IR sensors gives twice the range in the same conditions. Nine times more sensitive sensor gives three times the range. Modern staring cooled sensors usually have sensitivity (NETD) of 10 to 25 mK. Scanned sensors have had sensitivity of about 100 to several hundred mK, basically about an order of magnitude higher. This is because scanning system has a lot less time to handle a single pixel (integration time which is somewhat similar to shutter speed in regular cameras) compared to staring system. So staring sensors can have 2-3 times longer range than scanned sensors. IR bands. There are basically SWIR, MWIR and LWIR bands (short, medium and long wave). Each of these bands have their own pros and cons. MWIR is usually used in FLIR systems as it offers best overall performance in many conditions (like clear weather, hot and humid conditions). It offers much better resolution than LWIR using similar technology and is much more sensitive to temperatures that vehicles and aircraft emit. LWIR works better for cold targets against cold background and LWIR also penetrates certain weather conditions better (rain, heavy fog, clouds). However these are usually offset by MWIR sensor higher sensitivity against intended targets of IRST systems. SWIR is not usually used as it's not emitted but rather reflected. So it need some source of SWIR light for sensor to work. These sources are the same as visible light (stars, sun, moon, active illumination with laser/lamps). SWIR is also easily absorbed and scattered and usually has nowhere as long range as MWIR or LWIR systems. QWIP. QWIP is good solution for many applications, but main problem is very long integration time required to have similar detection performance to InSb or HgCdTe sensors. This means they have to give either frame rate or sensitivity to achieve otherwise similar performance. This is why most high-end military applications don't use QWIP technology, although it seems otherwise good. I understand tv beside IR sensor in FSO is good for help to identify in good conditions. But i see big problem on night. It could detect with Irst, but i do not see way for identify the object, and in web page of the brand, they tells can make identifications day and night. I do not know how is posible on night without imaging thermal sensor. If you are referring to OLS-35 brochure, I don't think there is a claim that it can make identifications day and night. Just that it works in day and night, which would be true even with non-imaging sensor. Su-35 brochures also say that "It is intended for searching and tracking of aerial and ground targets through their thermal radiation". As can be seen, the resolution is not the greatest for ID which is the reason for having - also for better resolution in daytime. - is definitely useful in OLS-35 also. Ok i understand, FSO IR cone bring sensor imaging infrared. I read only in one not official website in french language this, but in website official i did not see, for this i had doubts. But really i think tv module beside IR is not relevant but as you tells help. I think they went with TV system in Rafale because the IR channel had pretty poor resolution and was best used for searching for targets. TV system had superior resolution and it was also easier to design good long-range optics for it. For example Eurofighter and later F-35 didn't get TV system because they had significantly better resolution in their IR sensor. Their IR system is good enough for long range ID day or night, especially in F-35 with newer detector technology. I think this is why there is a - in OLS-35. AFAIK, Rafale is planned to get new IR system in the F4 standard but it will still be more of a search sensor due to wide FoV optics in IR system. TV system is retained for long range ID purposes. Of course upgraded IR detector would allow longer range ID in conditions where TV system is not effective. Interesting that "TVchannel" (with space between) seems to get edited by the system. What could be the reason for that? The FLIR was subject to extreme heat constraints in a very small volume. Therefore it quickly became too expensive. The second batch of OSF (OSF IT) was deprived of IR channel (but had a more powerful -), awaiting for new captors needing less cooling. It is worth noting that, soon after signature of indian contract, Thales hired a lead engineer fo OSF, mentioning the name of the future OSF, OSF IR, and that the job description clearly mentioned the IR channel. In the meanwhile, MiCA seekers are performing sort of an IRS function. hornetfinn wrote: I think they went with TV system in Rafale because the IR channel had pretty poor resolution and was best used for searching for targets. TV system had superior resolution and it was also easier to design good long-range optics for it. For example Eurofighter and later F-35 didn't get TV system because they had significantly better resolution in their IR sensor. Their IR system is good enough for long range ID day or night, especially in F-35 with newer detector technology. I think this is why there is a - in OLS-35. AFAIK, Rafale is planned to get new IR system in the F4 standard but it will still be more of a search sensor due to wide FoV optics in IR system. TV system is retained for long range ID purposes. Of course upgraded IR detector would allow longer range ID in conditions where TV system is not effective. Thanks again, now i understand it better. And i asked because i tried find good information in official websites but companies only write basical information, so it is imposible to know exactly how works the systems and how much good they are or not. I read DAS system on F-35 will get a big upgrade from Raytheon, and they promise duplicate features. Really could to tell will be a very big jump forward. Hi hornetfinn, are you sure that's an IR image and not a TV one? I'm asking this because (and of course I could be wrong) that image personally seems to be a TV image an not IR one. For example shadows seem to be clearly seen on the image (I don't think that shadows can be seen on IR images, right?) while on the same image it can be seen on the Rafale located below seems to have at least a two color paint scheme (another thing that I also don't think that IR images can show). I believe that the "low quality" of the picture is due to being a frame screenshot of the recorded (which if I'm not mistaken, usually has a lower quality than the actual imagery) and perhaps even the original TV imagery doesn't have a "very good" quality but here I digress. Yes, it's quite possible that you're right. At first look, they seemed to be the same type of aircraft (Rafales) due to some optic illusion and of course both aircraft having considerable resemblances (even more in images that don't have a very good quality). 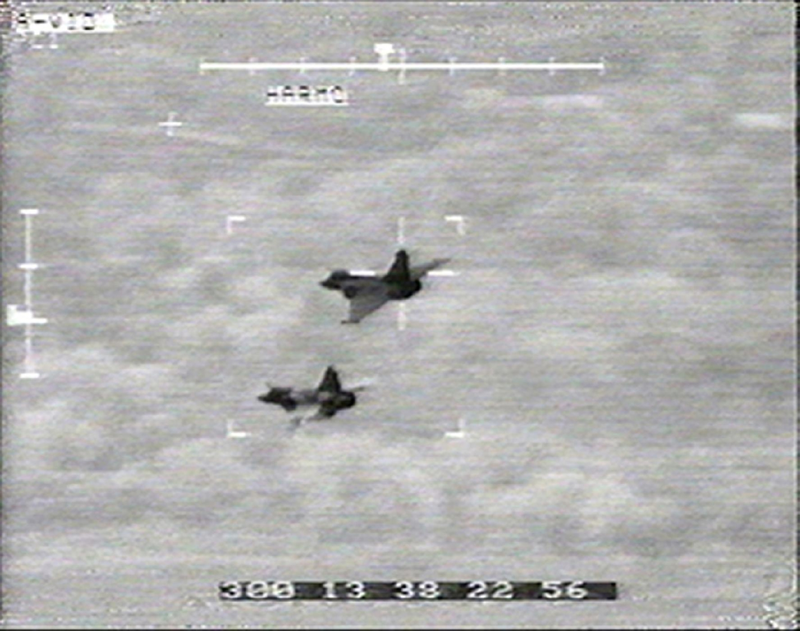 But taking a second look, yes I tend to agree with you that the lower plane is likely a Mirage 2000.
ricnunes wrote: Hi hornetfinn, are you sure that's an IR image and not a TV one? Of course it could be an error but it's also sometimes really difficult to tell image from thermal imaging system and monochrome TV system. It depends how the TI system is set up and configured. For example the used wavelength and what temperature range it operates affects the image qualities a lot. Naturally system resolution, sensitivity and image processing does as well. There are number of other things that affect the image quality and appearance, so it can be deceiving. This particular picture can well be from either the IIR or TV system. Thales site says it's IR image, but of course that might be an error as well. If it was an IR image, wouldn't you see a big heat plume out the back, like you do on the EODAS image above. glennwhitten wrote: If it was an IR image, wouldn't you see a big heat plume out the back, like you do on the EODAS image above. No, not necessarily. That depends on thermal imaging system properties (like type of detector and used wavelength) and how it was configured. For example LWIR system can easily be set up so that only the aircraft itself is visible and not the heat plume. EO DAS uses MWIR detector which is most receptive to higher temperatures and so the heat plume is very visible. Figure 13 in page 18 tells what aircraft components are dominant in each IR band. In MWIR it's the hot parts and plume. In LWIR it's the aircraft body itself. This is due to blackbody physics in each wavelength. That document is very relevant to this discussion in many ways and I'd definitely recommend reading it. I'm pretty sure that FSO IR channel is LWIR as that gives best performance for long range detection at high altitudes given the likely technology used. EO DAS and EOTS use MWIR as that's superior in all other ways (like ID, targeting and so forth). In FSO - is used for ID. I have a question; Missiles with IIR are harder to fool using countermeasures as flares. Missiles bring IIR inside its cone, but how does it know which is the heat source they need attack? are they using a database or some similar?